He was born in New Zealand to an American mother and New Zealand father and lived in the USA from shortly after his birth until he was 10. Boyd has lived in New Zealand since then, but has told The World Game in the wake of Phoenix's 3-1 win over Western Sydney Wanderers on Wednesday he is undecided about whether to commit to the Kiwis for national team selection or gauge whether there may be interest from the USA. DC_Dave, Testudo, Tom Collingsworth and 1 other person repped this. Do we have room for another T. Boyd on the squad? It's always good to have depth. beamish and Balerion repped this. He has played in the U20 World Cup in 2013, so he is provisionally cap-tied to NZ. And he has one senior cap. Sounds like he's just trying to make noise to get New Zealand's attention for more playing time. That's likeliest, since (at least as of the January article) he's not been contacted by US Soccer. And considering he made his debut for NZ in a friendly about two months after this article was published, mission accomplished. Using your dual nationality to publically put pressure on a federation for a international callup is actually proving to be an effective strategy in many countries. wixson7 and m vann repped this. "Meet the Weet-Bix Crew's Tyler Boyd: a football pro hungry to step up and take a shot at the top. See how he fuels his hunger--and how Weet-Bix can help fuel yours." 19yo and already 2 NZ friendly caps ... If we're going to make a run at him, better not wait around too long. TIGHT TUSSLE: Phoenix player Tyler Boyd and Adelaide United's Osama Malik contest possession in their opening round FFA Cup fixture. Newcastle United were pushed hard by Wellington Phoenix but the Premier League side were too slick in the end as they wrapped up a 1-0 pre-season friendly win at Westpac Stadium.... Both sides created chances from the outset, Tyler Boyd lashing an early strike on the turn into the side netting for the Phoenix. Best young YA striker prospect named T. Boyd? "We didn't come here to do anything else than to get a result," Hudson said. "We've come here today and we've had a good idea of where we need to be when we come to our qualifiers. Uzbekistan is always a team who are knocking on the door in terms of qualification. We always knew it was going to be a tough game. Tonight has given me a good idea of individual players and we're we are at as a group right now." Without doubt the midfield has been massively bolstered after an injury crisis exposed a lack of depth last season. It appears players like Kenny Cunningham, Louis Fenton, Vince Lia, Tyler Boyd and Matthew Ridenton will have to force their way in from the bench this season. "We came up against a very good Wellington Phoenix side and they are going to be tough this year," said Sydney coach Graham Arnold after Friday's draw. "Ernie has recruited well, they have some very good players in midfield with good mobility." Canterbury United struck twice against the Wellington Phoenix and drew praise from the A-League side's coach in yesterday's pre-season clash in the capital. Wellington Phoenix 6 (Roly Bonevacia, Jeremy Brockie, Alex Rodriguez, Kenny Cunningham, Tyler Boyd, own goal) Canterbury United 2 (Tom Schwarz pen, Ash Wellbourn) HT: 3-0. All Whites squad: Goalkeepers - Jake Gleeson (Portland Timbers, US, 6 caps), Oliver Sail (Wellington Phoenix, 0). Defenders - Michael Boxall (Phoenix, 9), Tom Doyle (Phoenix, 1), Jesse Edge (Vicenza Calcio, Italy, 0), Louis Fenton (Phoenix, 1), James Musa (Team Wellington, 1), Winston Reid (captain, West Ham United, 18), Storm Roux (Central Coast Mariners, 4), Tommy Smith (Ipswich Town, 27). Midfielders - Cameron Howieson (Burnley, 9), Dan Keat (Falkenbergs FF, Sweden, 5), Michael McGlinchey (Phoenix, 28), Tim Payne (Auckland City, 11), Bill Tuiloma (Olympique Marseille, 5), Ryan Thomas (PEC Zwolle, Holland, 2). Forwards - Kosta Barbarouses (Melbourne Victory, 26), Tyler Boyd (Phoenix, 3), Jeremy Brockie (Phoenix, 44), Marco Rojas (SpVgg Greuther Furth, Germany, 18), Joel Stevens (Phoenix, 1), Chris Wood (Leicester City, 35). 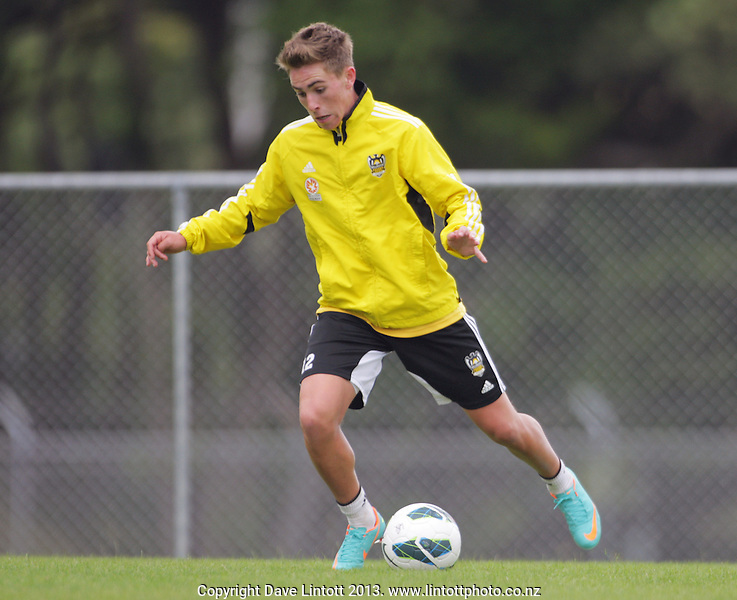 2 more braces with the reserves in ASB competition vs. Hawke's Bay United (12/7/14) and Southern United (2/14/15). Phoenix coach Ernie Merrick understood Boyd's desire to move offshore at the end of the season. "We have known for some time that Tyler wanted to play in Europe and I wish him all the best for the future," Merrick said. He's in the Primeira Liga with C.D. Tondela, on loan from Vitoria. So far has started one league match and one cup match. Interestingly, Boyd started for Vitoria yesterday at right wing in Liga NOS action against Benfica and went the full match. For what it's worth, he's not yet fully cap-tied to Australia, though I imagine they ought to be recalling him soon. @TheFalseNine "Tyler Boyd at Vitória de Guimarães (Portugal)"
Tom Collingsworth, UniversalAdvice, TheFalseNine and 1 other person repped this. For what it's worth, he's not yet fully cap-tied to New Zealand, though I imagine they ought to be recalling him soon. Tom Collingsworth, UniversalAdvice and ChuckMe92 repped this.